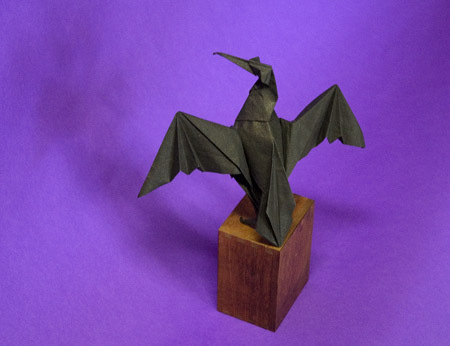 I decided to start my search with origami — the art of folding paper from a single, uncut sheet — and soon discovered there are a world of paper folders out there, doing everything from paper cranes to extreme origami. 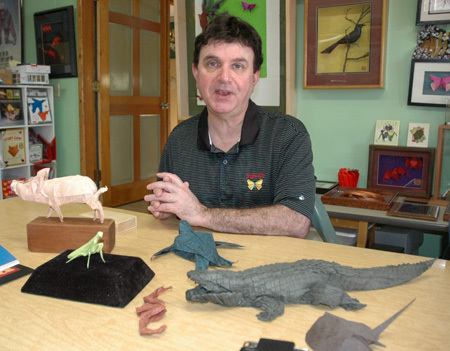 How thrilled I was to learn about Origamido, a commercial design studio, hand papermaking facility, and fine art gallery founded by Michael LaFosse and Richard Alexander in 1996, and located in Haverhill, Massachusetts, just a twenty mintue drive away. Michael designs, diagrams, and folds. Richard Alexander designs, specializes in making handmade paper, and shoots photography and video. 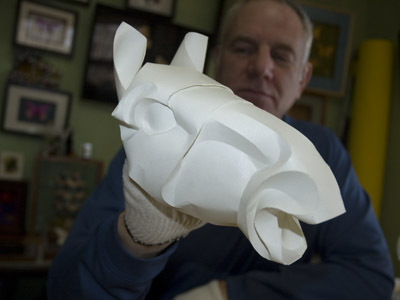 They are probably the only origami artists in the world today who routinely make custom paper. 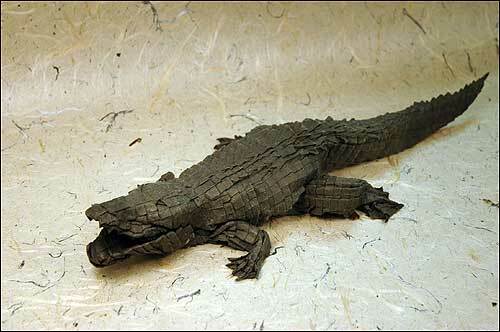 In fact, other master origami artists prize their papers, which are made with permanent, finely ground pigments so pieces will last hundreds of years. They make a living by publishing books of their work and by teaching in-school residencies. Both Michael and Richard have backgrounds in science, which explains the strong natural history focus to their work. Whereas a majority of origami is geometric, Michael is drawn to living subjects, rather than the intricate geometric forms. He was inspired by the work of Master Akira Yoshizawa, a key figure in modern Japanese origami, who originated the wet folding technique. Wet folding allows shaping that will stay in place when the paper dries. 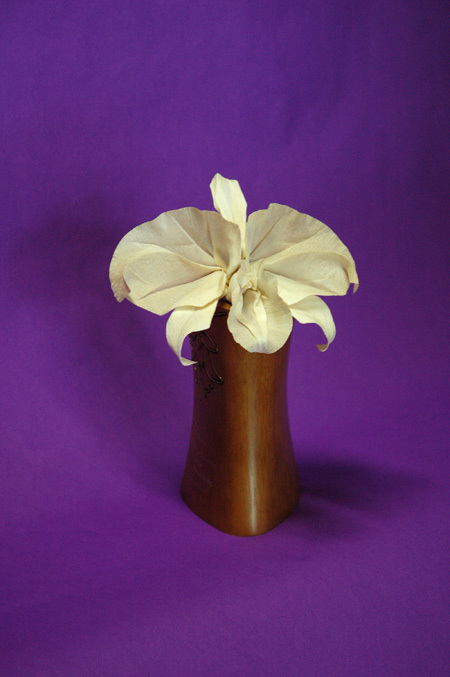 An elegant fold is one in which the geometry works naturally. The finished piece has to look alive. In preparation for making Wilbur the pig (1991), Michael spent many hours at the Topsfield Fair, observing piglets. Having the right paper was critical. Experimenting, he came up with the perfect handmade paper — pale pink in color, fairly stiff, with a fuzziness to its finish. The actual folding of the piece took approximately six hours. 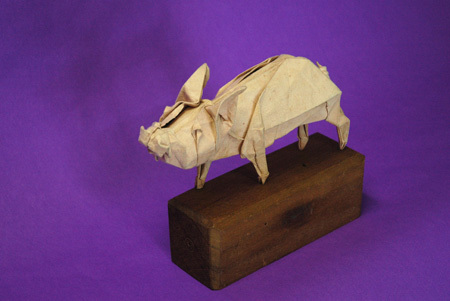 It’s absolutely amazing what people can create by simply folding a piece of paper. 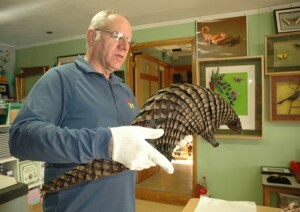 That alligator and pangolin are most definitely works of art. I look forward to seeing more at the festival in July.